If the Constantinople Patriarchate accepts schismatics under its omophorion, it will find itself outside the canonical Church, a member of the Moscow Patriarchate Synodal Commission, cleric of the Odessa Diocese Archpriest Andrey Novikov believes. “If, Lord forbid, Constantinople chooses to commune with Ukrainian schismatics, it will have no canonical authority, as non-canonical interference in “alien diocese” is severely punished by certain canons,” Fr. Andrey says in his article conveyed to Interfax-Religion on Friday. 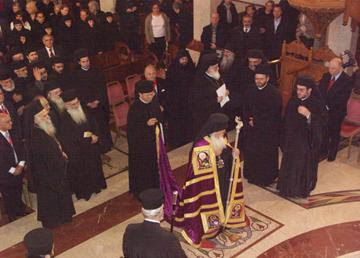 The priest states that the Constantinople Patriarchate “again after a short repose is ready to take anti-canonical actions and interfere into the jurisdiction of the Russian Orthodox Church.” Fr. Andrey believes that is how statements of some Constantinople representatives should be considered as they talk about their readiness to accept schismatics from the Ukrainian Autocephalous Orthodox Church in their jurisdiction.